"See, the bright light... it ain't heaven, son. It's just a muzzle flare." Okay, right off the bat, this review is going to be extremely biased. None of you have any idea how much I love this movie. Ever since I first saw it in 2007, I’ve watched it at least once every few months. I mean, come on. It has Nazi monsters, Ray Stevenson (Punisher: War Zone, Rome), gun fights, an eerie atmosphere, & an intriguing plot. It’s a whole lot of fun in a small package, & every time I see it, I can’t help but love it a little more. First, let’s the talk about the story…Nah, I changed my mind. First, let’s talk about Ray Stevenson. This guy is a monster. If any of you have seen Punisher: War Zone, you know what I’m talking about. This guy is a tall, muscle-bound, gladiator-looking being, which is appropriate seeing that he was one of the stars in the show Rome. His screen presence devours any scene that he’s in, & I wouldn’t have it any other way. This man is a great actor, & every time he speaks, I’m absorbed completely in whatever he’s talking about, even if I don’t quite understand what he’s saying. It’s not because he mumbles or anything, I just have a hard time understanding British/Irish accents sometimes. You wouldn’t believe how many times I had to watch Dog Soldiers before I finally got used to the nature of their voices. Anyway, Ray Stevenson, an awesome presence in every bit he’s in. Rightfully so, he plays DC, the level-headed leader of the band of mercenaries in this film. He uses his intimidating presence to full effect, making you believe he is the kind of guy to command a team of armed gunmen through hell & back (though that’s not necessarily hard for him). Basically, my point is that he’s the best part of this movie. However, it might help you to understand why by explaining what exactly this flick is about. In war-torn Easter Europe, a scientist by the named of Hunt (Julian Wadham) hires former Royal Marine DC (Ray Stevenson) to transport him to a secluded old military bunker for reasons he doesn’t quite say. DC accepts the offer, & together with his partner, Prior (Richard Brake), assembles a group of ex-soldiers to assist in the endeavor. Once they make it to the bunker & scope it out, however, they discover it’s not everything is quite as it seems (when is it ever). Unseen assailants take pot shots at them as they fire back aimlessly, strange lights brighten up the woods from unknown sources, & a strange machine rests deep within the halls they were hired to investigate. Soon, it becomes apparent that what they’re dealing with isn’t quite human, but is also a top secret Nazi experiment that was long forgotten…until Hunt went looking for it, that is. Giving any more details would just spoil the fun, so I’ll leave it at that. The story is very basic, but very fresh at the same time. I was never bored while watch it, & it was entertaining trying to put all the pieces together. It keeps you guessing about what’s going to happen all the way to when the credits roll. The explanation for what’s happening is very interesting, & I wish they kept this to just one movie instead of a trilogy. I’m not saying the sequels that follow this film are bad, but you’re definitely not missing anything if you don’t watch them. Aside from Ray Stevenson, the acting in this film is really on point. Everyone in the group has their own personality, & you’ll never be confused as to who is who. It all feels organic, like they are actually a team of mercenaries that don’t really care about each other, & are just working together for a paycheck. When everything starts to go down, the cast radiate the feeling of dread, hopelessness, & survival perfectly to whoever is watching it. Or at least me, I can’t speak for everyone. Guess you’re just going to have to watch the movie to see if that’s the case now, huh? Right? The soundtrack isn’t that memorable, but I don’t mind that because it makes up for it in many other aspects. The gunfights, for instance, are beautiful. I don’t know why it looks like all the gunmen are using “tracer rounds”, but it’s great. You can see every burning piece of lead fly through the air across the screen, & it’s pretty. The shootouts alone are enough reason to give this film a look, trust me. I would go one to explain how the antagonists look, but again, that’s spoiler territory. I’ll just say they look great, as well do the effects in the film. Overall, like I said before, I love this movie. The action, the suspense, the story, the acting, Ray Stevenson; this movie is just full of good things. If you want to watch something fun & fresh, definitely give this a view. You won’t regret. 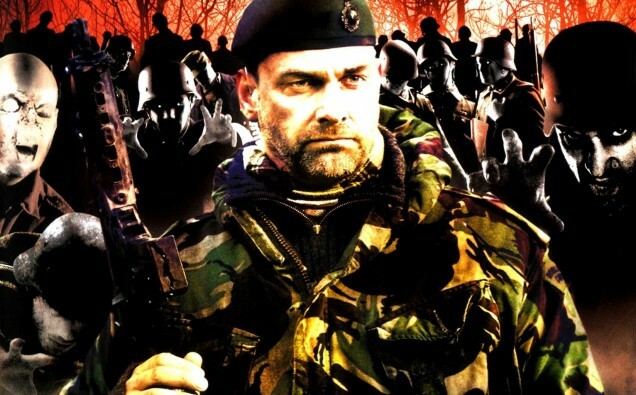 Also, it has Ray Stevenson in it. Yesterday was actually the anniversary date of this film’s release. Perfect timing for a review! Really?? I had no idea! That’s awesome!